← Engine Lane, Brownhills – mystery solved! Nice knitwear... and a great 'tache. Stonnall's tintinabulists from the 70's ring out. Picture kindly supplied by Graham Evans. This really is ‘a tangle of bells’. I thought your Stonnall readers would like to see this photo of a worthy and very successful group of tintinnabulists in the 1970s. I feel sure that some faces will be instantly recognised by the villagers. The bells were made by Whitechapel foundry in London, who also made Big Ben- their bells are certainly the world’s best for clarity and purity of tone. Handbell ringing in this country has a wonderful, rich dimension to its history. Just imagine the huge national rallies of the late 1800s… a glimpse at the intricate set competition music of that era gives an idea. At a national rally in Wembley Conference Centre a few years after this photo was taken, one group actually played the Black and White Rag… on Handbells! Amazing. The biggest handbell is nearly as big and as heavy as a bucket! This entry was posted in Brownhills stuff, Events, Features, Interesting photos, Just plain daft, Local History, Local media, Local music, Reader enquiries, Shared media, Shared memories, Social Media, Walsall Wood stuff and tagged Brownhills, Brownhills local history, David Evans, hand bell, Handbell, Local History, New Photos, seventies, Silly, Staffordshire, Stonnal, Stonnall, tintinnabulsit. Bookmark the permalink. Great pic. A friend and I have consulted on this and are convinced that the youngster standing at the left of the second row from the front is Roger Gaul, local farmer’s son. Roger was in our year at Shire Oak school (our first year was 1976) and was the epitome of a gentle giant. Long before any of us had even learned the word puberty, Roger, who towered over us and was twice as broad, was growing a moustache and talking in a hushed baritone. Of course, given his size he was drafted into the rugby team, though his heart was never in it. On one occasion he asked to be excused a Saturday morning match because he was involved in a cake-baking competition. 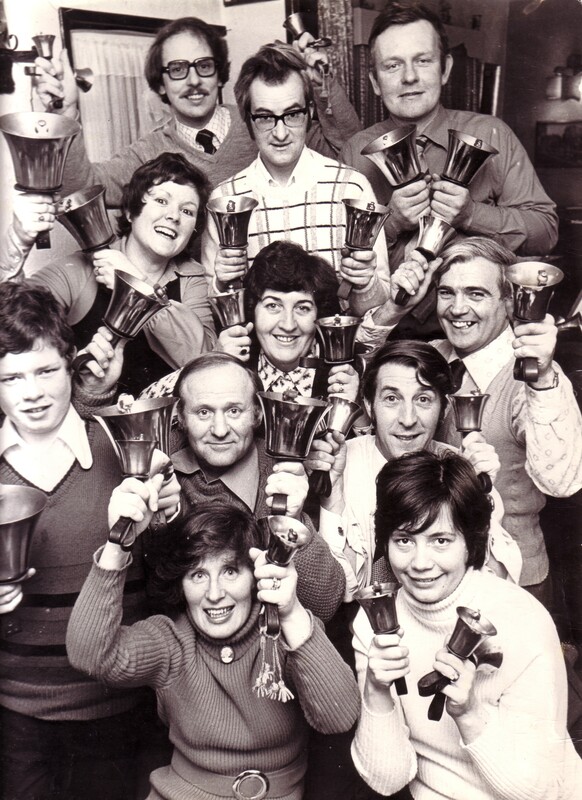 On another – and this is where my rambling tosh finally becomes vaguely relevant – he was in a handbell-ringing competition. Being the callous and blinkered youngsters that we were, we all found this hilarious and incomprehensible at the time, though with hindsight he was Shire Oak’s very own renaissance teenager. Whatever Roger’s up to now, I hope he’s well and still, ahem, ploughing his own furrow. It is, indeed, Roger Gall, one time member of Stonnall’s scout troop. Other people in the picture are, in the centre, Betty Amphlett, and between her and Roger, Betty’s husband Harry. Others seem familiar, but a quarter of a century on…. Indeed the Stonnall Hand-Bell Riners were a great band. Their LP vinal record is a classic.I took their photograph at the Harrogate competitive music festival in 1985 when they won the hand bell class in great style. This photo is included in my book “Hand -Bell Ringing The Living Tradition – RINGING FOR GOLD.to be published summer 2012. Peter Fawcett. I have a 12 inch 45 rpm vinal record, the record and cover are in good condition, if any one is interested.